We’re looking at heritage-related jurisprudence — decisions by the courts, Ontario Municipal Board and Conservation Review Board about the Ontario Heritage Act. In the Ministry of Tourism, Culture and Sport’s guidance package, the Heritage Tool Kit, there is one court decision that jumps out. In fact it is the only decision discussed in the Tool Kit. The case concerned the historic franco-ontarian church in the hamlet of St. Joachim, 40 km east of Windsor. The church’s owner, the Roman Catholic Diocese of London, was carrying out an amalgamation — “clustering” they called it — of three parishes, including St-Joachim. The diocese declared the church redundant and closed it, then sold it and made demolition a condition of the sale. A demolition permit was issued. A community group, SOS Eglises, sought to save the church from destruction and have it designated by the municipality under the OHA. But the council of the Town of Lakeshore wanted none of it. It went so far as to pass a resolution to require that any requests for designation of heritage property be made by the owner of the property! Its refusal to even consider the designation of St-Joachim resulted in a court challenge by SOS. Interestingly, the town defended its position by arguing that a designated building could be demolished by the owner after 180 days (true, before the 2005 amendments to the OHA provided so-called permanent demolition control powers), so what was the point of designating unless the owner was on-side. In fact, the council — at that point — just had no appetite for a fight with the diocese over preservation of the church. The court was not impressed, noting that while the power to designate is a discretionary one, there are limits on the exercise of discretion; here the town had attempted to tie its own hands by setting a pre-condition (owner’s consent) on the use of its powers; and this was patently unreasonable (the test for judicial intervention) given the purpose of the OHA and the fact that the Act obviously anticipated that property owners might not consent by providing a process for hearing objections. So the question of designation of the St-Joachim was tossed back to the council for reconsideration. Which then occurred, resulting in… a rather kooky decision to designate the spire and belfry of the church, with the intention of moving them to ground level as a kind of memorial so all the rest of the building could be demolished. Objections from SOS led to a major Conservation Review Board decision in 2007, which got things back on track with the designation of the whole building. Which led to the town refusing the diocese a new demolition permit (in the meantime the OHA had been strengthened). 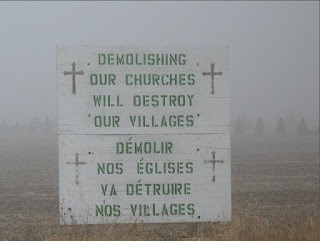 Which led to an appeal by the diocese to the Ontario Municipal Board… an appeal the diocese abandoned a few weeks before the hearing was set to begin. Whew! Today the much fought-over building still stands, still awaiting a new use. Tremblay is rightly considered a landmark. It essentially says municipalities cannot have a policy against designation without the owner’s consent, and that a municipal council must give unique consideration to each proposal that comes before it. At the same time it is the practice of most municipalities not to undertake designation where owners are unwilling (what are sometimes slyly called “hostile” designations); in other words the non-consent of the owner weighs definitively in their decisions. They just don’t put it in writing. Finally, from an advocate’s perspective, I think more use could be made of this case by Architectural Conservancy Ontario and other groups to push municipalities — and their sometimes torpid heritage committees — to consider designation of properties at risk. Heritage designation will never be mandatory, folks. Tremblay is as good as it gets. Note 1: Designating Heritage Properties, page 10.